This was quite interesting for me. Using a fun hair color and a technique I have not done often. 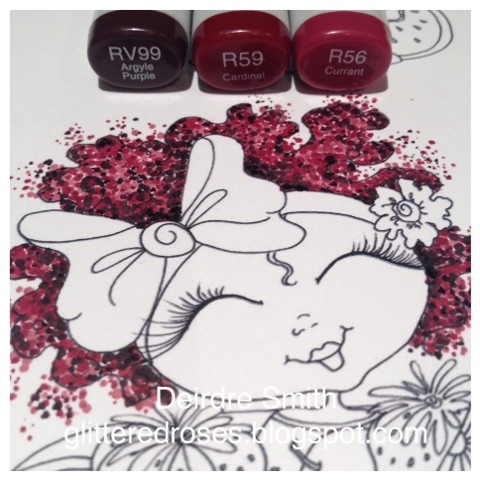 I looked at Deirdre tutorial, it is the post previous to this one, on the technique of dotting. I have done this before but using it for curly hair is fabulous! You get depth and texture. I loved it. So much fun stepping "out of the box" with hair color. Left over creative goodies were used. 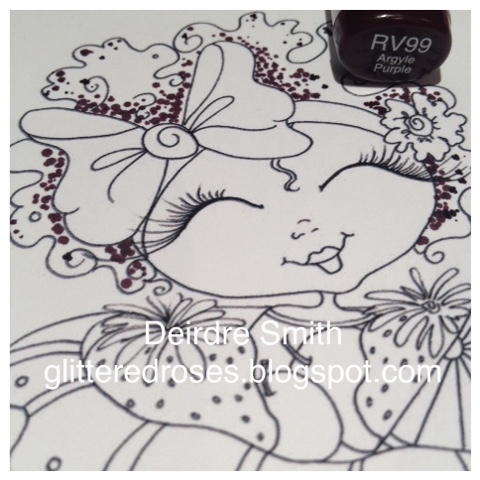 Yippee love using odds and ends up. 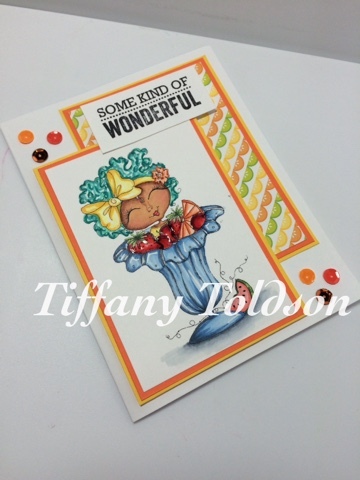 Such a fun card to make. I enjoyed every moment of this project. 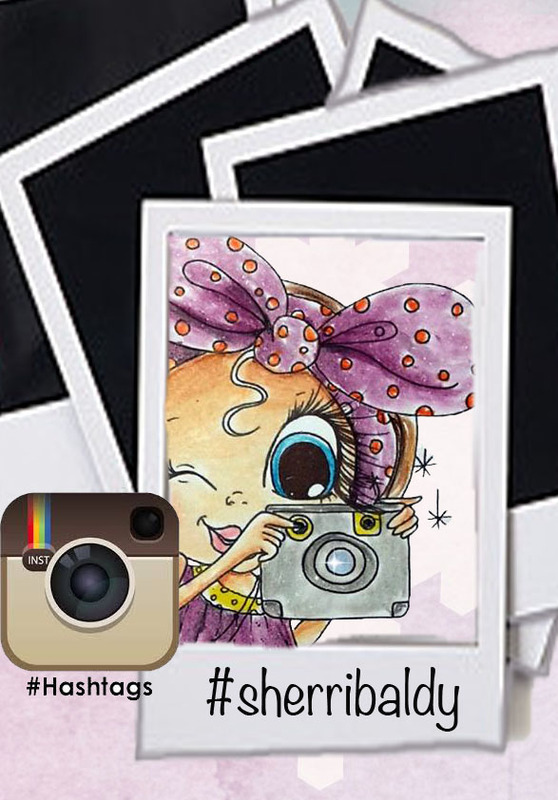 Thanks Sherri for sharing your time and talents your images are so much fun to work with. 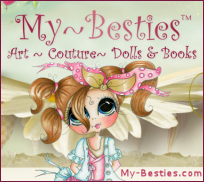 I'm Welcome Crafty friends to MyBestie! 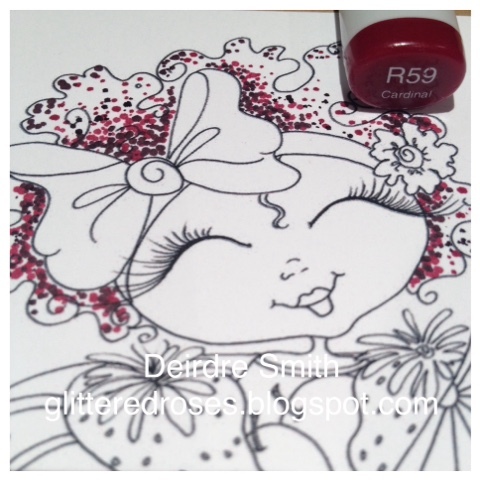 I am enjoying the summer and with that that means coloring fun summer images. 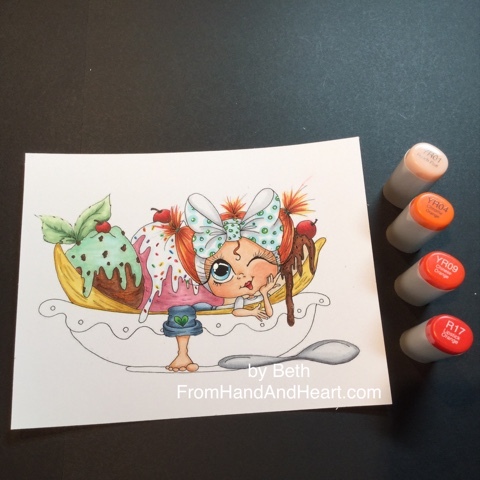 So today I am sharing this cute image that totally makes me think of a summer fun picnic. You can fine her here. 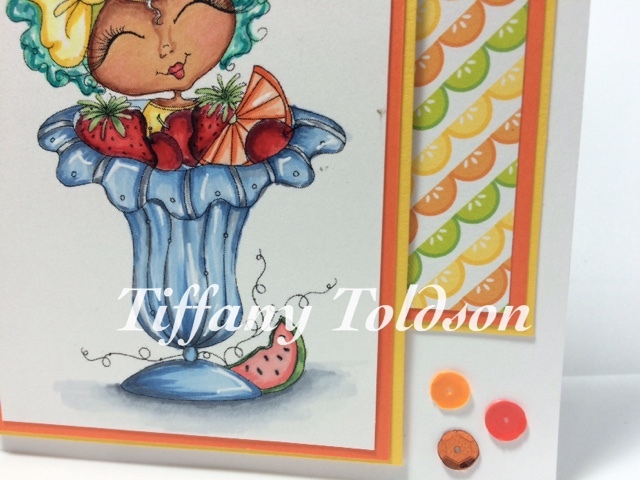 I used Doodlebug Design "Sunkissed" 6x6 paper pack (again) for this card... Can I just say this paper pack is so perfect for summer card making. 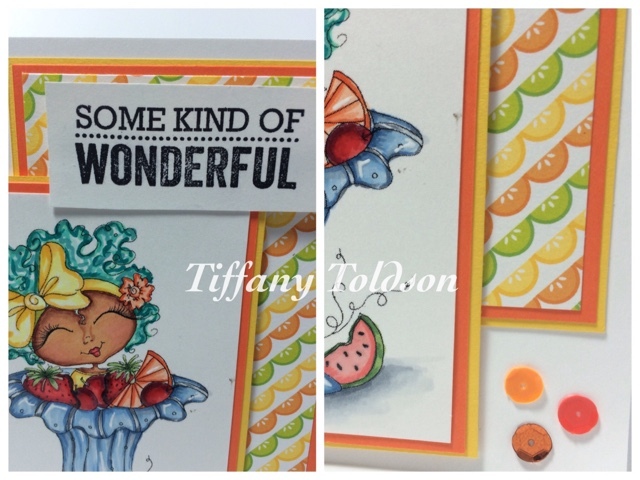 The stamp is from a Studio Calico PL kit, and the solid card stock is just basic yellows and oranges from my paper stash. Having a Fun Hair Day. Hi Everybody. It's Beth again. 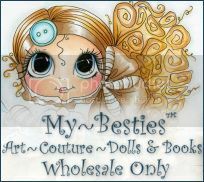 I wanted to share this cute Bestie image #644. 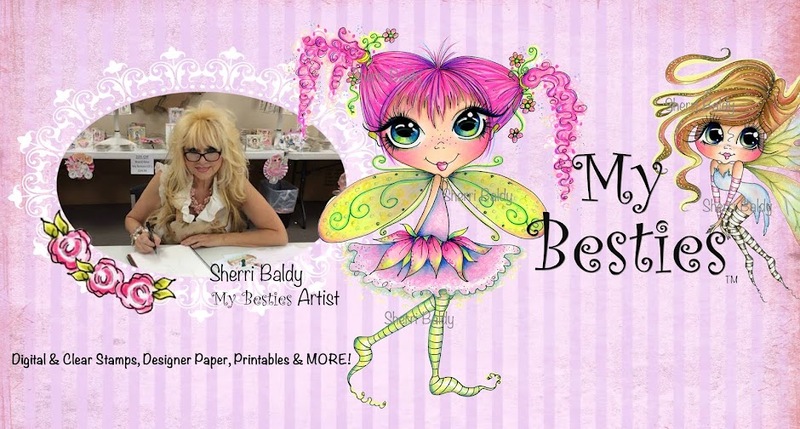 You can purchase this downloadable image from Sherri Baldy's Etsy site. We were asked to challenge ourselves with the hair color. Well let's just say I'm not very adventurous with my hair color. I have always stayed "in the box". So I went Crazy, for me, with orange. This was bold for me. I really ended up enjoying the fun color. 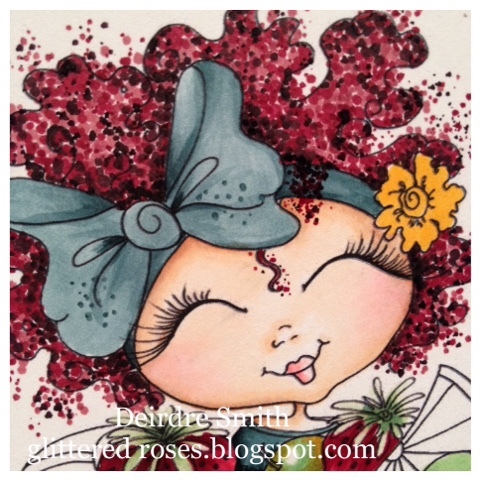 I need to find some time to play with vibrant colors for hair. I made this card into an ice cream gift card holder. I can't wait to give it away. Once again I used up lots of odds and ends. 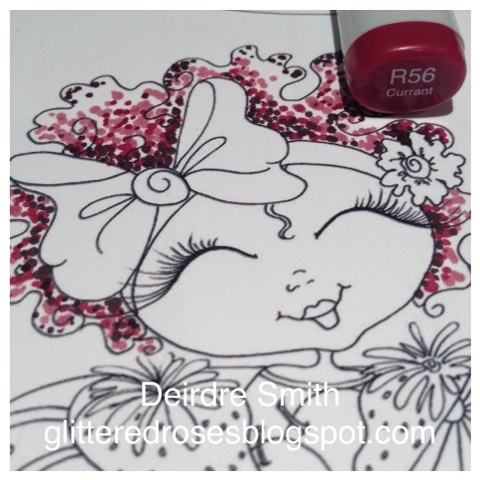 Some Stampin Up retired paper. 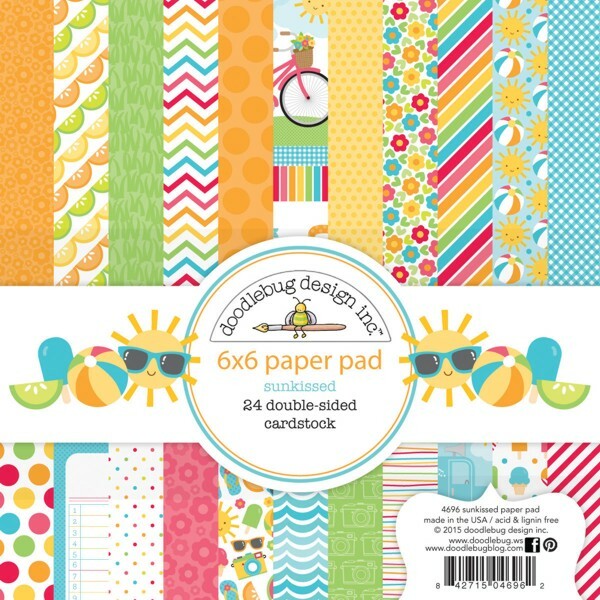 Echo Park paper from the "I Love Sunshine" pack. I hope you enjoyed this sweet girl. You can find the image here. Hi Friends!! I altered a picture frame that I had purchased at Michael's a while back. 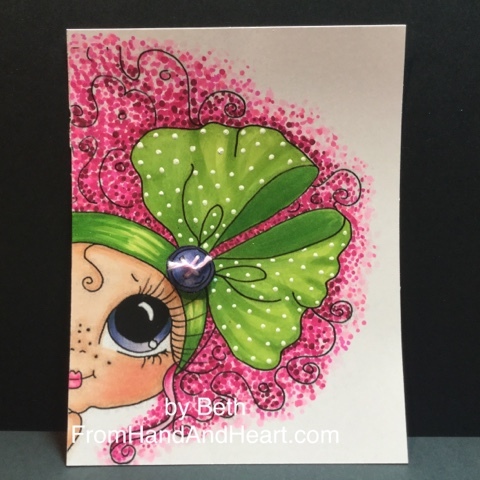 I added a double bow made with seam beading at the top of the frame, I then added a butterfly, and then colored my gorgeous Bestie digi stamp. I wanted to color a fun color for hair and of course I picked pink (my favorite color lol). I hope you guys will try this for a different look. I had so much fun coloring her in. Have a great day! 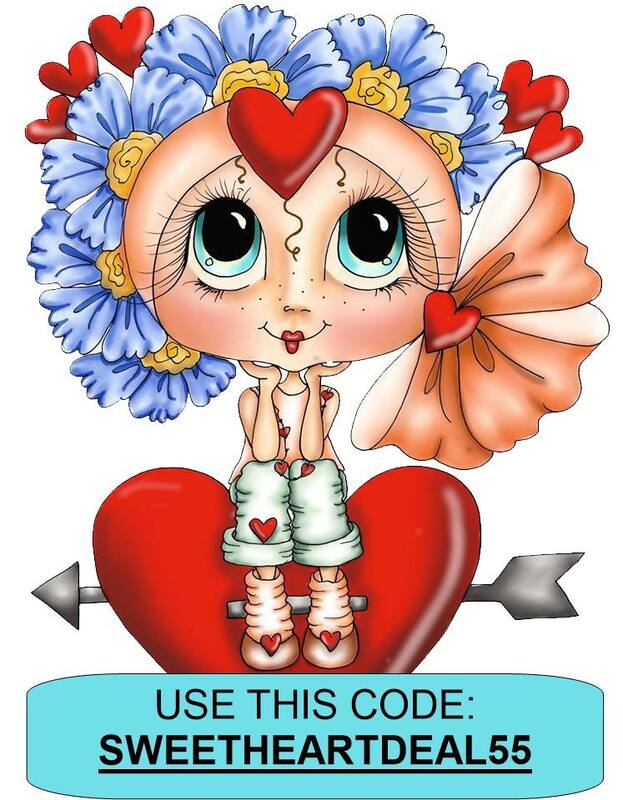 You can find this cute digi here. Isn't her hair color just beautiful!?! Hey! It's another Color and Create me, Tiffany. I am super excited about today's card from My Besties. I chose an image that reminded me of the phrase "Peek a boo". I made a really simple card that says a lot. 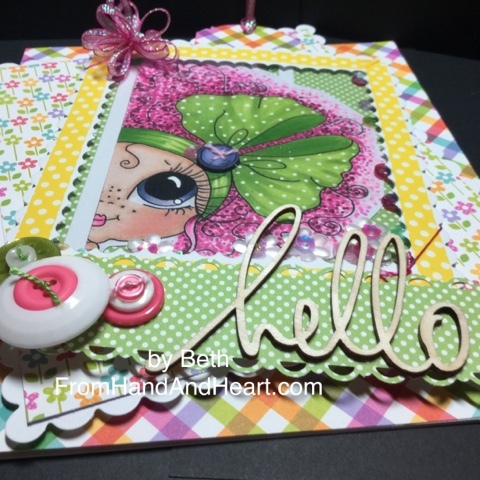 The image used is framed in a Mama Elephant die. On the back of all my cards I use a personal stamp that I had made at my local office store. 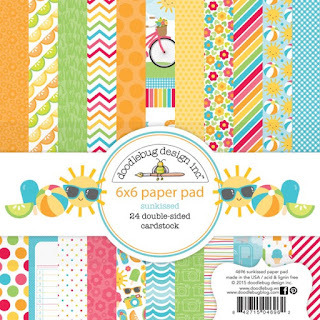 I used this paper pack by Doodlebug Design which I am loving. It is perfect for this time of the year. 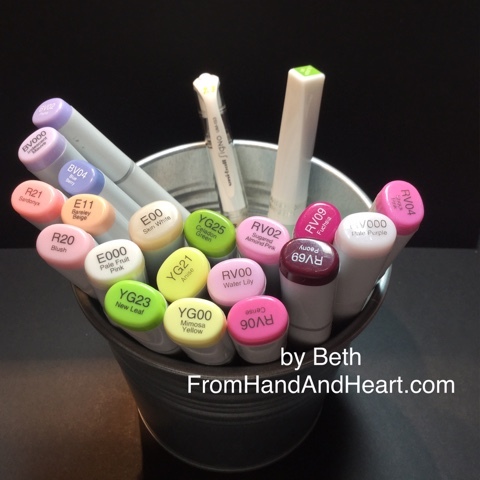 This was a up close and personal image these are all the markers I used. 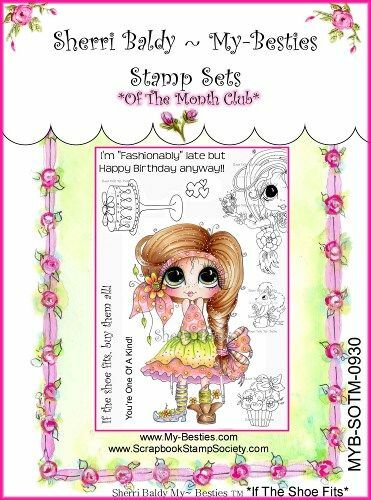 I keep all my embellishment in these cases that I purchased from Stampin' Up. 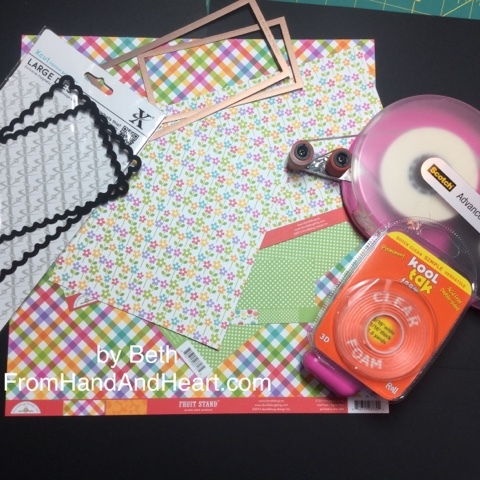 Each case is covered with color card stock and inside are embellishments that match the outside. 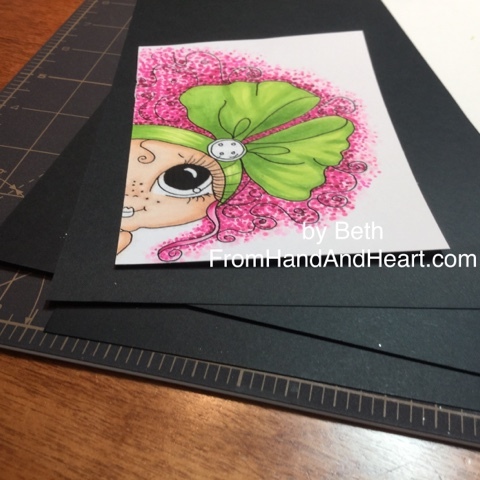 Here is the finished card!